“What is marriage certificate”A marriage certificate is an official recorded document issued by a governmental authority that proves that the couple listed on the marriage certificate has a legal marriage.A marriage certificate usually contains who married who, when they were married, where they were married, who married them, and who was there. As a matter of fact, it has become important for every couple who are interested to marry each other to go for a marriage certificate these days. The requirement for marriage certificate does arise if there a situation arises, where the individual needs to prove that he is legally married to a person and the purpose could be to obtain passport, change the maiden name, etc. In Chandigarh and the rest of the country, marriage could be registered under two marriage acts, namely Hindu Marriage Act of 1955 and Special Marriage Act of 1954. In order to be eligible to get married, males are required to be at least 21 years of age while female is required to be 18. The parties to Hindu marriage need to be divorced or unmarried, or in case, previously married, spouse of that marriage needs to be dead. Besides this, the parties need to be mentally and physically healthy. They should not be in any way prohibited by the Indian constitution. Only Hindus are applied with the Hindu Marriage Act whereas Special Marriage Act gets application to every Indian citizen. Hindu Marriage Act offers registration of already solemnized marriage. However, it does not offer solemnization of marriage by Registrar. Solemnization of the marriage including the registration conducted by a qualified Marriage Officer is provided by Special Marriage Act. How to apply for Marriage Certificate? The Marriage Certificate is a very important document that is required by every Indian couple, irrespective of their religion. The couple is required to apply properly to the Registrar, under whose jurisdiction, marriage has been solemnized or to that Registrar under whose jurisdiction both the parties to marriage are residing for a minimum of six months, preceding immediately the marriage date. The pre-process requirements are address proof (voter id, driving license, passport, ration card, gas bill); proof residence and 5 joint photographs of couple with groom and bride signatures over photo. The parties of the intended marriage is required to give the Marriage Officer, in the jurisdiction of whose, one party at least is to reside for over 30 days before the notice date. It needs to be affixed at a particular conspicuous place in the office of the Officer. In case, both or either party resides in another Marriage Officer’s area, then a notice copy is to be sent to that Officer for the purpose of similar publication. Marriage might be solemnized after one month expiry from the notice’ publication date, only if objections are not presented. However, if objections are presented, then it is the duty of the Marriage Officer to enquire into it and to take a proper decision as to whether the marriage is to be solemnized or to have the marriage refused. Registration is possible after marriage is solemnized and the marriage certificate can be availed. Any marriage that already has been celebrated could be registered under Special Marriage Act. But a clear public notice is to be issued of thirty days that would be subject to the conditions. The bride and the bridegroom need to have completed 18 years and 21 years of age. The documents to be produced are age proof, residence proof, passport, ration card, voter ID, landline bills, driving license, property bill, 3 witnesses not related to any to the couple ad 9 photographs of each. 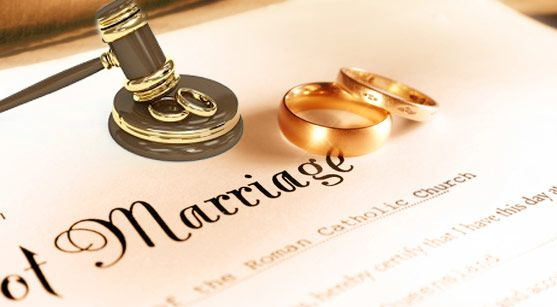 All the above mentioned procedure, one another procedure is also available for the needy couple, whose with own personal reason can’t follow the procedure in normal way and require the marriage certificate is as soon as possible. Advocateinchandigarh have huge experience of dealing with of such cases. Advocateinchandigarh helping the couple to perform the court marriage and precure the marriage certificate from the registrar in the same day.